When? 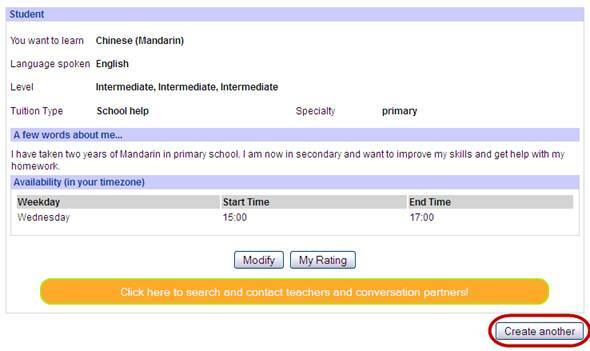 You will create a second student profile when you want to learn/practice a second foreign language on Lingworld. Why? 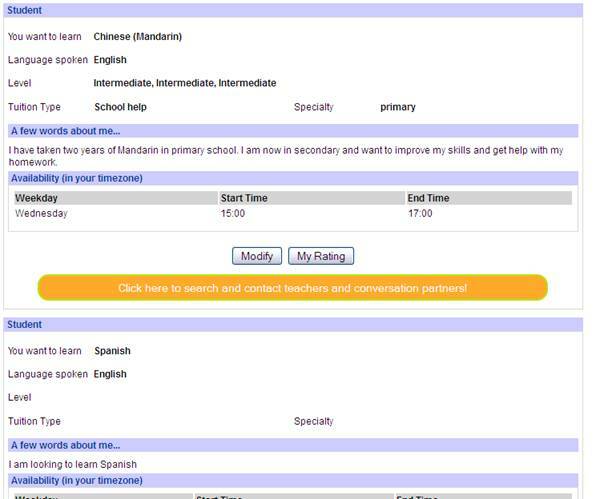 The second profile will inform the Lingworld teachers/conversation partners about your requirements, level and experience about the second language you would like to learn/practice. 1. Click Student in the My Profile section of the navigation pane. Your existing Student profile opens. 2. Click the Create another button in the bottom right corner of the screen. The Create Profile screen opens. Fill out the fields as accurately as possible. The fields are described in detail below. Choose the language you want to learn from the dropdown list. Choices include: Chinese (Mandarin), English, French, Japanese and Spanish. So that we can better match you with an instructor, check the boxes next to the languages that you currently speak. Choices include: Chinese (Mandarin), Spanish, English, Portuguese, Arabic, Hindi, Russian, Japanese, German, Vietnamese, Korean, Tamil, French, Chinese (Cantonese), Malay, and Thai. If your native language is not listed, choose Other. Choose your level of competency for the language you would like to learn. Level is available for Chinese (Mandarin), English and French. Level is not available for Japanese and Spanish. The levels available are: Beginner, Intermediate, Advanced, High School and University. 3. Click Open. The selected photo is uploaded to your profile. There are several types of tuition to choose from. Choose the tuition type that best matches the type of help you are looking for. Options include Master Class, Conversation Partner, Specific Language Skills, School Help and Translation. Note: TuitionTypes vary by language and are not available for Spanish and Japanese. Type any information you would like the teachers on this site to know about you. This space can be used to include any information which will help the teachers on the site tailor their teaching to your needs. This can be anything including learning disabilities, grade level, availability and any other general information. Click the Email Notifications heading to view the Notify me when there is a new teacher that matches my criteria checkbox. Check this checkbox if you would like to be emailed when a new teacher matching your criteria joins LingWorld.com. Leave the checkbox unchecked if you don’t want to be notified. 3. Once you have completed your Student profile, it should look similar to this. 4. Click the Create Profile button to create your second Student profile. Your second Student profile is complete. To view both profiles, click Student in the My Profile section of the navigation pane. Both Student profiles display.